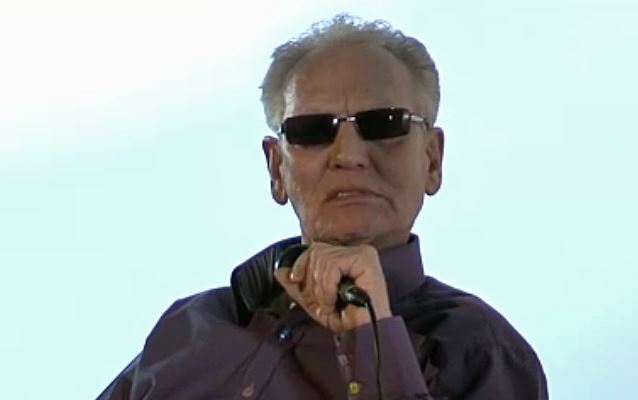 Legendary rock and roll drummer Ginger Baker, whose resume includes stints with CREAM, BLIND FAITH and PUBLIC IMAGE LTD, has slammed heavy metal as "an abortion," explaining that he finds "people that dress up in spandex trousers with all the extraordinary makeup incredibly repulsive." Baker, who gained a reputation as the most uncontrollable musician on the scene, was the subject of a 2013 documentary, "Beware Of Mr. Baker", which painted the title character as a chain-smoking, profanity-spewing, mean-spirited, entitled, grouchy, vile and self-destructive man with otherworldly talent and tragic flaws. Asked in a brand new interview with Jim Clash of Forbes.com what his take is on heavy metal, Baker responded: "These people that dress up in spandex trousers with all the extraordinary makeup — I find it incredibly repulsive, always have. "I've seen where CREAM is sort of held responsible for the birth of heavy metal. Well, I would definitely go for aborting. [Laughs] I loathe and detest heavy metal. I think it is an abortion. "A lot of these guys come up and say, 'Man, you were my influence, the way you thrashed the drums.' They don't seem to understand I was thrashing in order to hear what I was playing. It was anger, not enjoyment — and painful. I suffered on stage because of that [high amplifier] volume crap. I didn't like it then, and like it even less now. "That whole Rock And Roll Hall Of Fame thing — at least half the people in there don't have a place in any kind of hall of fame anywhere, in my opinion." Baker also offered his colorful take on LED ZEPPELIN's late drummer John Bonham, saying: "Years ago, John said, 'There are two drummers in rock and roll, Ginger Baker and me.' There's no way John was anywhere near what I am. He wasn't a musician." He continued: "A lot of people don't realize I studied. I can write music. I used to write big band parts in 1960, '61. I felt that if I was a drummer, I needed to learn to read drum music. I was so good at sight reading, a guy in one of the big bands told me to get two books. I studied them at the same time. One was about the rules of basic harmony, the other how to break them all. [Laughs]"
According to Rolling Stone, Baker "repeatedly sabotaged his success, reputation and personal life with a hair-trigger temper, poor financial choices and a preference for drugs and exile over attachment and responsibility," the consequences of which "dog him to this day." In a Rolling Stone interview, BLACK SABBATH guitarist Tony Iommi revealed that, when Bill Ward exited the band in 2012, producer Rick Rubin thought Baker would be a good replacement. Iommi told the magazine: "I thought, 'Bloody hell?' I just couldn't see that." SABBATH ended up hiring RAGE AGAINST THE MACHINE drummer Brad Wilk to play on their comeback album, 2013's "13".